If you want to imbue a discussion with an air of gravitas, you start by identifying the main character by his full name: George Herman Ruth. Dwight David Eisenhower. Homer Jay Simpson. So consider the case of one William Joseph Buckner, who almost two decades ago (the precise anniversary is Wednesday, Oct. 25) bent over to field a grounder hit by Mookie Wilson. We all know what happened after that -- you've seen the video a few jillion times, you've read about the scapegoating, and the subsequent reaction to the scapegoating. After 20 years of scrutiny under the electron microscope of modern media, the Buckner play has been dissected so thoroughly that you pretty well know everything about it. It's not often that a new chapter can be added to a story that's been told so many times, especially two decades down the road. But that's what Uni Watch has for you today -- a bona fide addition to the historical record of the most infamous error in World Series history, courtesy of a sharp-eyed photo editor and a 12-year-old kid, both of whom spotted what a generation of baseball historians had missed. And this new find goes a long way toward explaining what happened on the field that night at Shea Stadium. As you can see, it shows Billy Buck walking off the field after his historic miscue, and he has removed his first baseman's mitt from his right hand. "I'd worked with that photo maybe half a dozen times in the past," Hintz says. "It's definitely one of my go-to shots for that play." 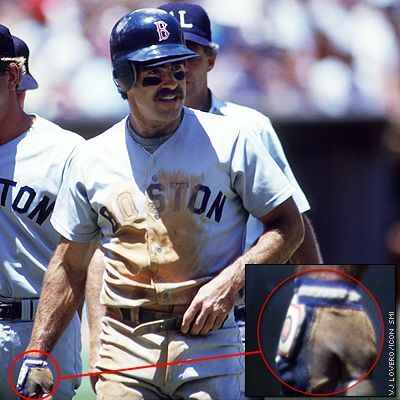 This time, though, for whatever reason, Hintz noticed that Buckner was wearing a batting glove under his mitt. Nothing unusual about that -- lots of first basemen do it. But Hintz, perhaps influenced by having worked on too many Uni Watch columns, was curious about what was printed on the glove. So he zoomed in on it. Then he zoomed some more. The poor Red Sox. It's bad enough they were saddled with one curse; they didn't know they were actually fighting two of them. No wonder Buckner missed that ball. He never had a chance. And it gets better. 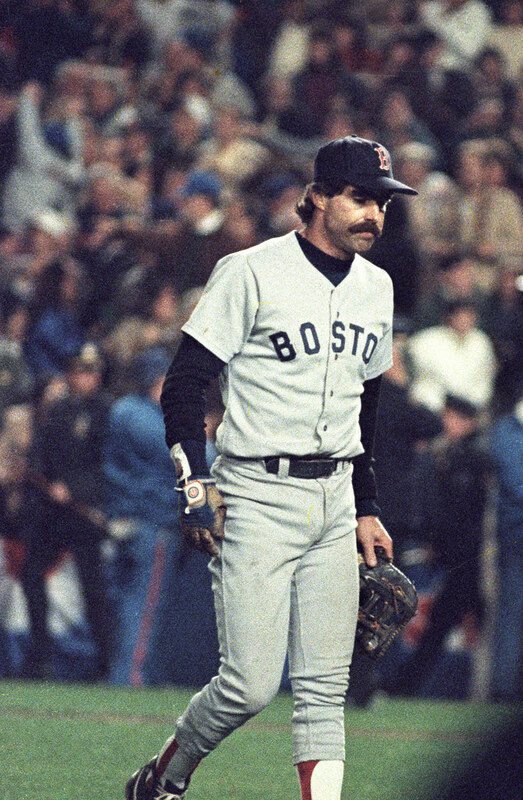 An examination of Buckner's at-bats from that game shows that he was wearing dark Franklin gloves while hitting. So apparently he went out of his way to wear the white Cubs-branded glove in the field. 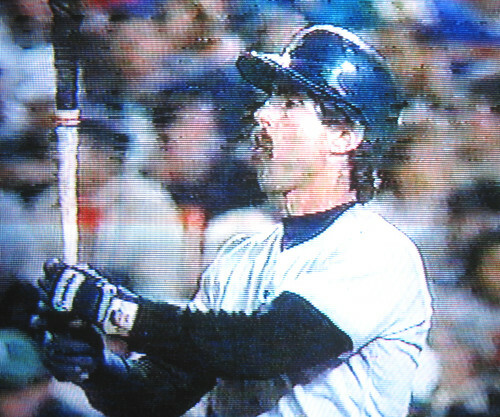 Whatever the explanation, it's not going to come from Buckner, who is understandably weary of discussing the play. When approached by a Uni Watch intermediary, he declined to comment, saying, "I'm all '86ed out." But wait, Bill, we don't want to rehash every gory detail -- we just want to know about the batting glove! To which one William Joseph Buckner replied: "I didn't even realize I was wearing it." End of discussion. Look how beat-up the glove looks, and then compare that to the World Series shot above. Looks like the same well-worn, loved-to-death gauntlet, no? Face it, you don't hold on to a glove like that over the course of two seasons unless it means something to you -- something special. Don't buy it? 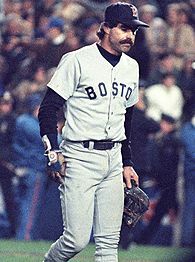 Then ask yourself this: Would Buckner really have gone out of his way to find more than one Cubs glove to wear while playing for the Sox? The obvious conclusion: This was Bill Buckner's lucky glove. Not. Whatever the glove's double-whammy properties, the most amazing thing about it is that it went unnoticed for 20 years. Uni Watch has approached a slew of researchers and historians over the past week, none of whom was aware of Buckner's double-cursed right hand. Uni Watch then queried the membership of the Society for American Baseball Research -- again, a big whiff. The enormity of the scoop was confirmed when Uni Watch consulted uniform designer Todd Radom, a passionate BoSox fan whose knowledge of historical logo-related arcana dwarfs Uni Watch's own. "I remember where I was when this happened (of course) but have never noted the Cubs detail," he responded. "Partners in misery indeed!" Even Rusty Kennedy, the Associated Press photographer who took the photo, was unaware of what he had documented. "It's funny, the photo has been published so often, but I never noticed the batting glove," says Kennedy, who still works for the AP. "If it were shot today, it would be digital and you could blow it up and study it all different ways, but in those days it was pretty superficial, because you just looked at the print. I'll bet I would have noticed it given another 20 years, though." "While leafing through the book Greatest Moments in Sports History, published by Sports Illustrated, Kevin Mahon (son of yours truly) noticed a picture showing Buckner -- a former Cub -- walking off the field after that fateful error during the 1986 World Series. On his right hand he is wearing a batting glove. And while the photo is not crystal clear, there appears to be a red-white-and-blue logo on the glove with four letters: C-U-B-S."
But Mahon's story was tiny and understated (a charge that will never be leveled at Uni Watch's treatment of the topic), had no accompanying photo, and was buried at the bottom of a hurriedly assembled column, so it was the journalistic equivalent of a tree falling in the forest with nobody around to hear it. "We got no response from it -- none," says Tom Mahon. "Anyway, Kevin's the one who put two and two together in terms of the double curse. I wouldn't even have thought of that." Kevin Mahon, now 15, hadn't even been born when Mookie Wilson stepped into the batter's box back in 1986. But he was familiar with the Buckner play and understood its place in baseball history. "I remember seeing a TV show about it," he says. "And I thought, 'Wow, how could he miss that?'" He answered his own question when he found that Greatest Moments in Sports History book at a flea market in October of 2003. 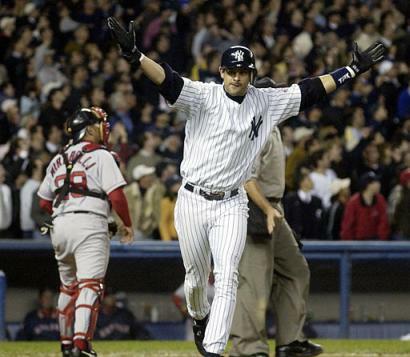 The Boston and Chicago curses were both fresh in his mind, because Aaron Boone and Steve Bartman had just become household names. 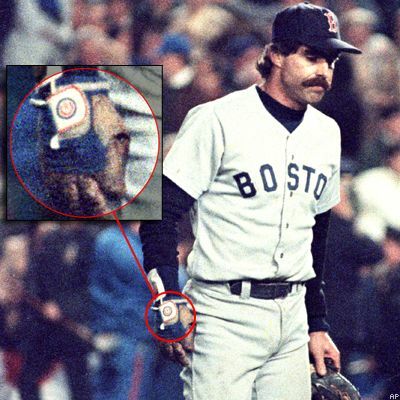 So when he saw the Cubs logo on Buckner's glove, everything clicked into place. He showed it to his dad, and that's how it ran, however sotto voce, in the Philly Daily News. And just how did a 12-year-old manage to spot what everyone else had overlooked? "I don't know," says Kevin. "I get interested in things sometimes." Spoken like a true uni watcher. Kevin Patrick Mahon -- welcome to the club. • The Devils are wearing a 25th-anniversary patch (here's a closer look). • All refs and linesmen must now wear black helmets, which means no more bare-headed action for Mick McGeough or Kerry Fraser. • And here's a spectacularly esoteric tidbit, courtesy of Society for International Hockey Research member R. J. Pratt: "Guillaume Latendresse of the Canadiens is wearing No. 84. Big deal? Well, it's the first time in NHL history that it's happened during the regular season. 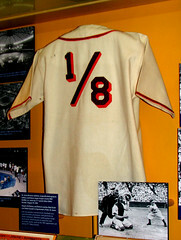 (I'm sure it had been worn in exhibitions before by minors-bound players.) It was also the last number that had never been worn in NHL history. Everything else -- including 0 and 00 -- had been worn before. Jonathan Ferland of the Canadiens wore No. 86 last year, leaving only 84 as yet to be worn. Latendresse can now claim to be the greatest No. 84 in NHL history." In other follow-up news, Uni Watch suggested last time around that the Sabres' instantly infamous Buffaslug logo appeared to owe an aesthetic debt to the Kent State Golden Flashes. 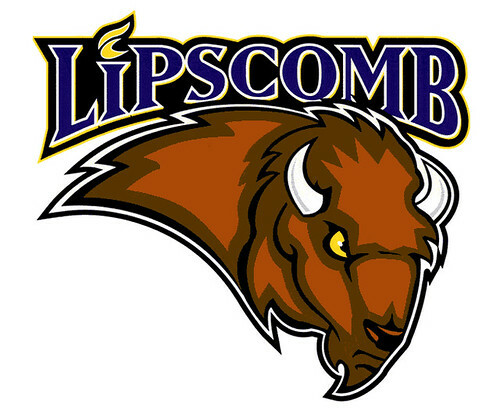 But Patrick Ford points out that the real inspiration may have been the Lipscomb University Bisons. And Uni Watch's mention of the rarity of players whose uni numbers were fractions prompted responses from Jennifer Muller and Keith Kreindler, both of whom pointed out that Robert Merrill often wore No. 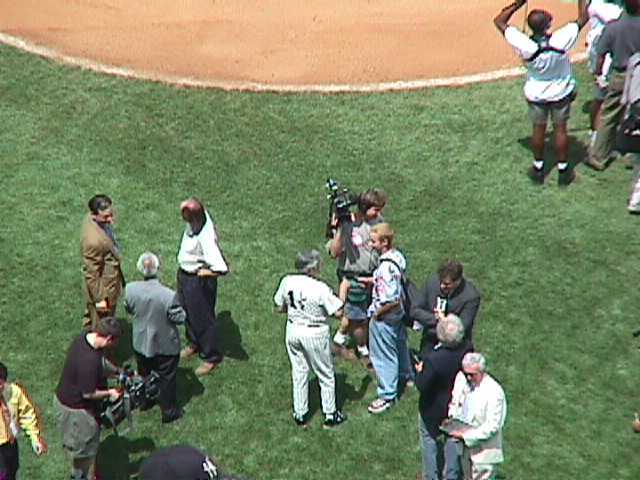 1 1/2 when singing the National Anthem at Yankee Stadium. Back next week with a special Uni Watch World Series edition. Until then, keep up with all things uni-related with the Uni Watch blog. And don't mix and match your curses. Paul Lukas doesn't have a middle name, so he has to supply his own gravitas. His Uni Watch blog, which is updated daily, is here, his answers to Frequently Asked Questions are here, and archives of his columns are available here, here and here. Got feedback for him, or want to be added to his mailing list so you'll always know when a new column has been posted? Contact him here.